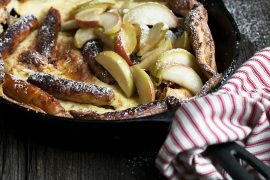 A delicious and easy Weekend Breakfast Skillet that’s cooked entirely in the oven. 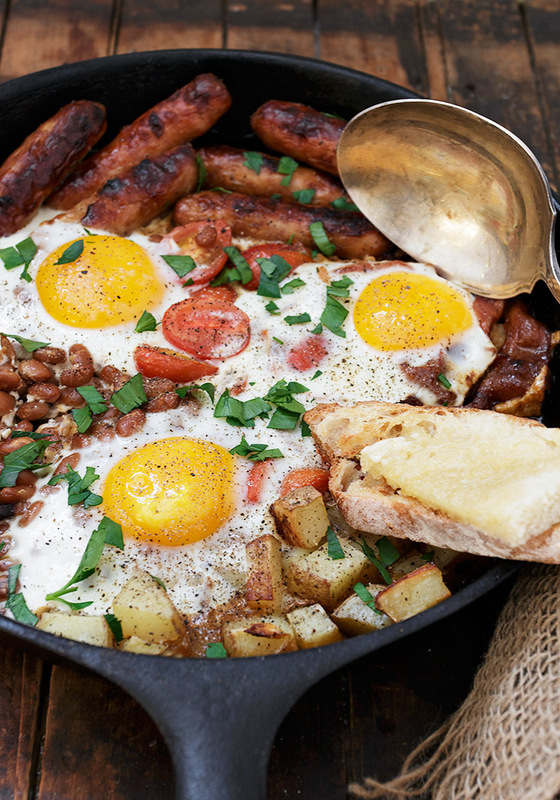 This skillet of goodness features sausage, bacon, eggs, tomatoes, potatoes and baked beans. Enjoy for breakfast or breakfast for dinner! As you are reading this, I will be hitting the highway south, heading to Toronto for a quick weekend visit with the daughter. She loves when we visit. At least that’s what we tell ourselves. Ok. Let’s just settle on she doesn’t really mind, since we are usually bringing things with us – food, pieces of furniture, baked goods. Our daughter is enjoying that first real job/first apartment in the big city phase of her life – or “adulting”, as she likes to call it :) It’s been fun for us to help her get settled and having a place to land while enjoying a regular dose of city life doesn’t hurt either. The daughter would not be a fan of this dish though, since she’s vegetarian, but we love it, so I thought I’d just take a minute to share it today, since you know … it’s the weekend and all. 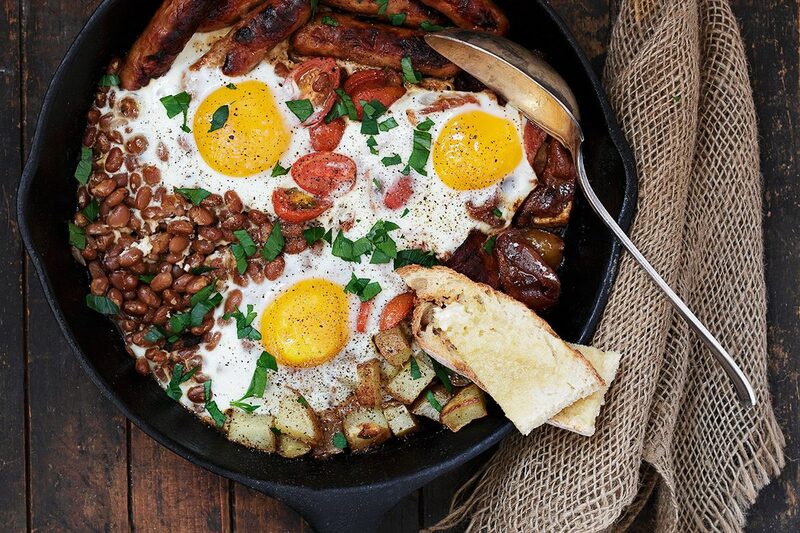 This skillet of goodness features sausage, bacon, eggs, tomatoes, potatoes and baked beans. It takes almost an hour in the oven, as it cooks up in stages, but it’s pretty much passive cooking time, as your only job will be to open the oven and throw something else in to the skillet. Enjoy it for a weekend breakfast or as breakfast-for-dinner! My skillet is 10 inches in diameter across the top, so fairly small. 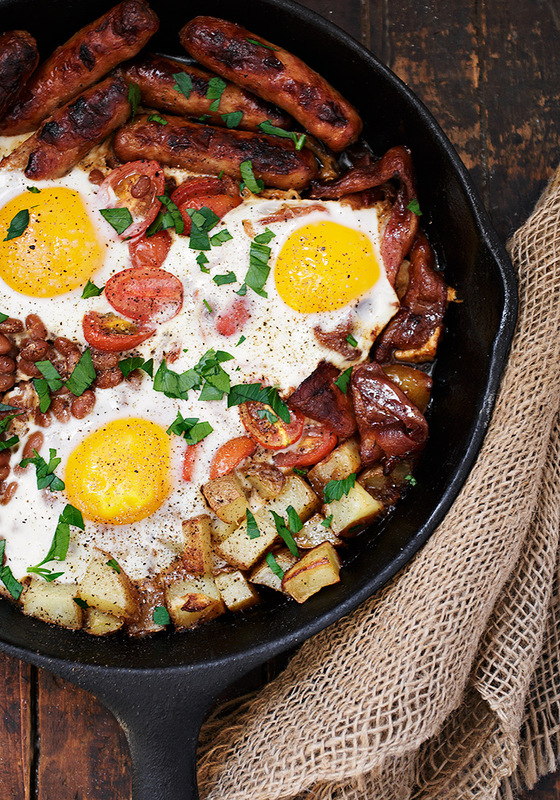 It’s works perfectly for a skillet breakfast for 2-3. If your skillet is larger, you can certainly put more of each ingredient in and serve more. 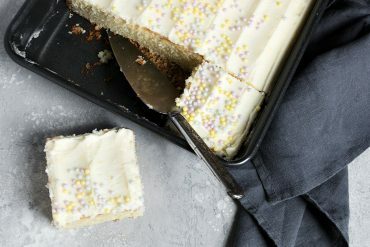 Just be careful not to get too carried away and try to put too much in the pan, as it won’t cook as nicely if it’s crowded. 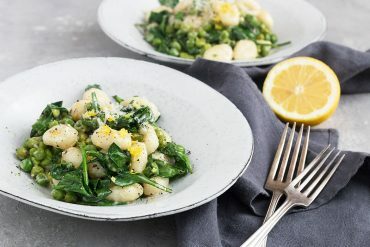 I will often add spinach to this dish, if I have some on hand. If you’d like to add some greens, add it when you add the tomatoes. 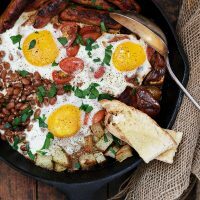 An easy and delicious breakfast skillet, cooked entirely in the oven. With sausage, bacon, eggs, tomatoes, potatoes and baked beans. Brush the bottom of an oven-proof skillet with cooking oil. Add sausages in an even layer on one side of the skillet. Scatter potatoes in an even layer on the other side. Stir potatoes around a bit to coat with a bit of oil and season with salt and pepper. Place in preheated oven for 10 minutes. Remove from oven. Flip sausage and stir potatoes. Make some space in the center of the skillet and place 3 strips of bacon down the centre, as flat as possible. Return to oven for 20 minutes. Remove skillet from oven. If you have some extra fat from the bacon, carefully spoon some of it off and discard. Move the bacon to the side, flip the sausages and stir the potatoes. Add your tomatoes to the centre of the skillet and return to the oven for 10 minutes. Remove skillet from oven. If you have extra moisture from the tomatoes, carefully spoon off and discard. Flip the sausage and stir the bacon and potatoes. Make some space in the skillet and add the baked beans. Crack 3 eggs over-top. Return to oven for about 15 minutes, or until beans are warmed and eggs are set. 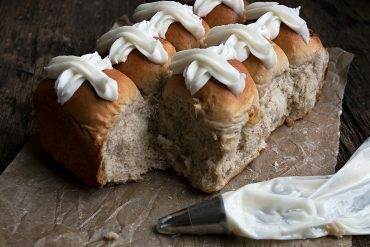 Serve with warm buttered toast. Good Morning, Jennifer! I do believe our Spring is in full swing now! Had to tell you that I made your breakfast skillet (for supper) the other night and it turned out great! It was delicious. I took a picture and wish I knew how to share it with you. 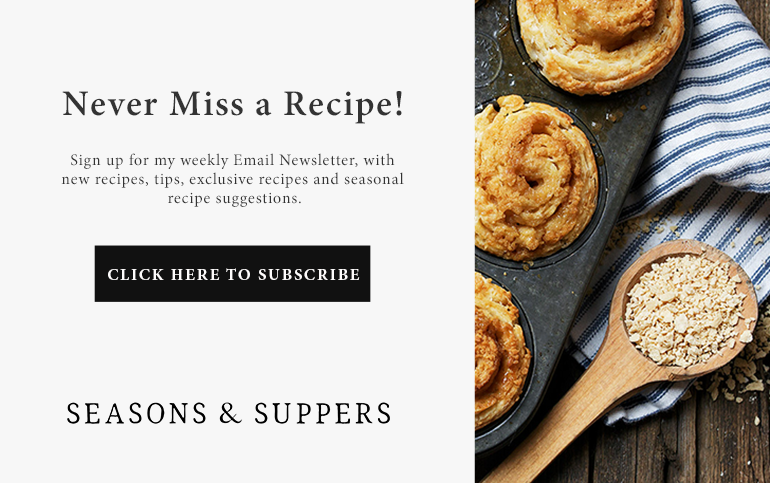 As always, your recipes are fullproof and yummy! Thank You! Oh my gosh this just looks so good (even though Im not a meat eater lol) the pictures are just stunning and it would be so adaptable. This is the perfect one skillet weekend meal! This is such a cool idea for a breakfast although I am very much inclined towards eating this for dinner coz it has all those yummy breakfast things in it! Is there anything better than ‘one skillet’ meals?! This dish is as pretty as a picture – I could eat it morning, noon and night! Pinned! This would totally be dinner for me, eggs are so comforting at the end of the day, and this would be the ultimate brinner! Enjoy Toronto and your daughter! I hope you had a wonderful time with your daughter, Jennifer! 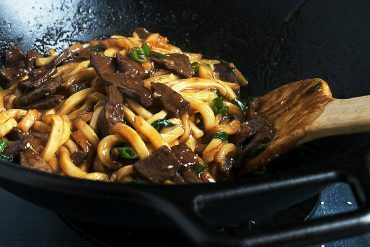 Its a shame she is a vegetarian, because this skillet looks AMAZING! But then again, I guess that just means more for you guys. ;) I love that this is so easy to prepare and you really stuffed this skillet with ALL the deliciousness! Love that you added baked beans too! I totally need to make this next weekend for the hubster and I… but I might make it in two small skillets, because I don’t like to share. <3 Cheers, friend! Thanks Cheyanne and had a wonderful visit! And yes, more for us, for sure ;) I love the idea of individual skillets, too. Jennifer I do love your recipes. After having enjoyed your ‘Irish Spice Bag’ both with chicken and fish (2 x nights in a row!!!) along comes another easy meal. My husband will love it and I shall give him all the beans! Enjoy your visit with your daughter – our daughter lives 2 days journey by air from us, so,we don’t meet up very often. 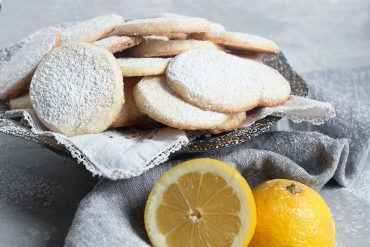 Thanks for the fun recipes!! Hi Mary and thanks! I love the idea of that spice bag with fish. I’m trying that :) I’m lucky that my daughter is close enough to visit regularly, for sure. Thanks so much, Tricia :) Had a wonderful visit! OMG Jennifer! My husband and I would enjoy this skillet for any meal of the day. I love all the meat included! So nice and hearty. And the baked beans too! Bring it on girl! 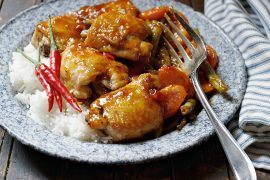 Hearty and full of flavor – I’m sure this would make my whole family happy! Have a great weekend. This is the ultimate “one dish” meal!! 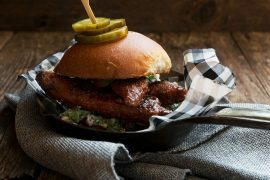 Crowd pleasing and delicious weekend fare.